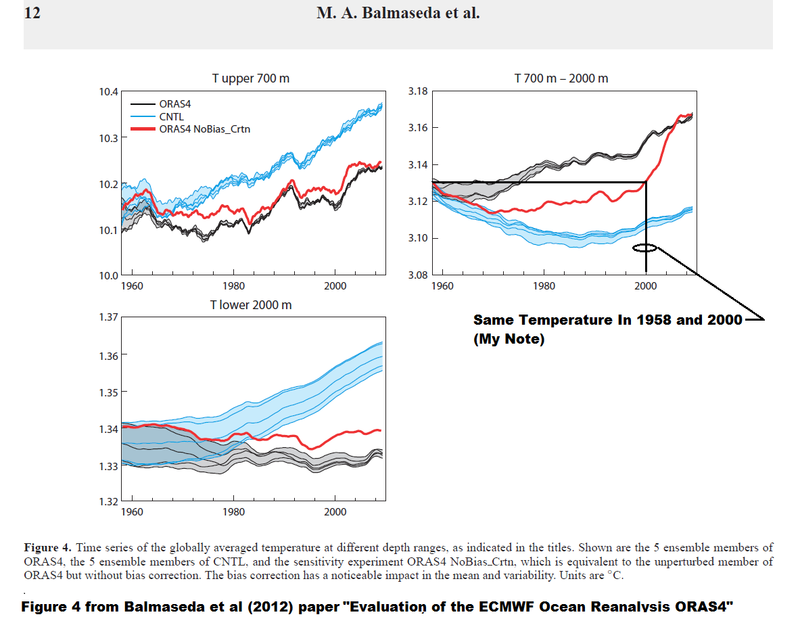 Kevin Trenberth is one of the authors of new Balmaseda et al (2013) paper Distinctive climate signals in reanalysis of global ocean heat content. It is important to evaluate the impact of assimilation in ORAS4 by comparing it with a simulation that does not assimilate data. This simulation, called the control integration (CNTL), uses the same spin-up, forcing fields, SST/sea-ice relaxation and relaxation to climatology (with 20-year time scale) as ORAS4. The black curves are the five ensemble members of ORAS4. And the red “NoBias_Crtn” curve “is equivalent to the unperturbed member of ORAS4 but without bias correction.” All of the graphs show how poorly the model, the blue “control integration” (CNTL) curves, simulates the warming. The bottom cell shows no warming at depths below 2000 meters in both the black ORAS4 curves and the red “ORAS4 without bias correction” curve. For depths of 700m to 2000m, the right-hand cell, the red “ORAS4 without bias correction” shows the same temperature in 1958 and 2000, but the black ORAS4 curves show a gradual warming due to bias corrections. Is the upward swing in the red “ORAS4 without bias correction” a result of the introduction of ARGO floats to a dataset that had poor spatial coverage before them? For the upper 700m, the red “ORAS4 without bias correction” curve shows little to no warming from the mid-1960s to the mid-1980s, when an upward shift takes place. The red “ORAS4 without bias correction” curve basically remains unchanged from the early 1990s to 2000, when another upward shift takes place, leading to another plateau. Upward shifts give the appearance that Mother Nature is the primary cause of warming, and that’s not practical in a world that’s supposed to be warmed by greenhouse gases, so that would definitely need to be corrected. The bias corrections in the black ORAS4 curves smooth out the 2000 upward shift to make it look like a more gradual increase, and the corrections lower the temperature significantly before 1990 to provide a greater long-term warming. Some of you might think these are yet more examples of inconvenient results being resolved through corrections. Okay, we’re back to the Balmaseda et al (2013) paper Distinctive climate signals in reanalysis of global ocean heat content. That’s the paper coauthored by Trenberth. The elusive nature of the post-2004 upper ocean warming has exposed uncertainties in the ocean’s role in the Earth’s energy budget and transient climate sensitivity. Here we present the time evolution of the global ocean heat content for 1958 through 2009 from a new observational-based reanalysis of the ocean. Volcanic eruptions and El Niño events are identified as sharp cooling events punctuating a long-term ocean warming trend, while heating continues during the recent upper-ocean-warming hiatus, but the heat is absorbed in the deeper ocean. In the last decade, about 30% of the warming has occurred below 700 m, contributing significantly to an acceleration of the warming trend. The warming below 700 m remains even when the Argo observing system is withdrawn although the trends are reduced. Sensitivity experiments illustrate that surface wind variability is largely responsible for the changing ocean heat vertical distribution. It would be interesting to see just how much the warming trend is reduced when ARGO data is removed. Figure 2 is, I believe, Figure 1 from Balmaseda et al (2013). Since the paper is paywalled, the illustration is from the World’s oceans are getting warmer, faster post at CarbonBrief. It illustrates the warming of ocean heat content for the depths 0-300 meters, 0-700 meters and “total depth”, but because there has been no warming below 2000 meters in the ORAS4 reanalysis, the “total depth” is kind of misleading. The SkepticalScience post New Research Confirms Global Warming Has Accelerated also presents that same graph. And of course, Joe Romm cross posted Dana1981’s post from SkepticalScience as In Hot Water: Global Warming Has Accelerated In Past 15 Years, New Study Of Oceans Confirms over at Climate Progress. Curiously, looking back at my Figure 1, the only acceleration appears in the red “ORAS4 without bias correction” for depths of 700m to 2000m, but that should have been excluded from Balmaseda et al (2013). Do Balmaseda et al (2013) address how much of the long-term warming is also a response to “surface wind variability”? 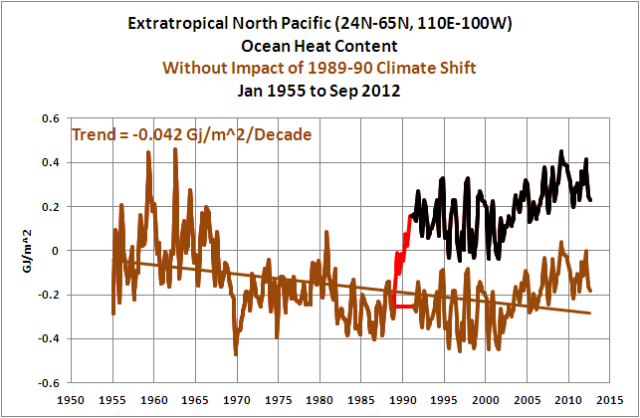 As an example, see Figure 3, which shows the NODC ocean heat content (0-700 meters) for the North Pacific north of 24N, with and without the 1989-1990 shift that’s likely caused by a shift in the “surface wind variability”. 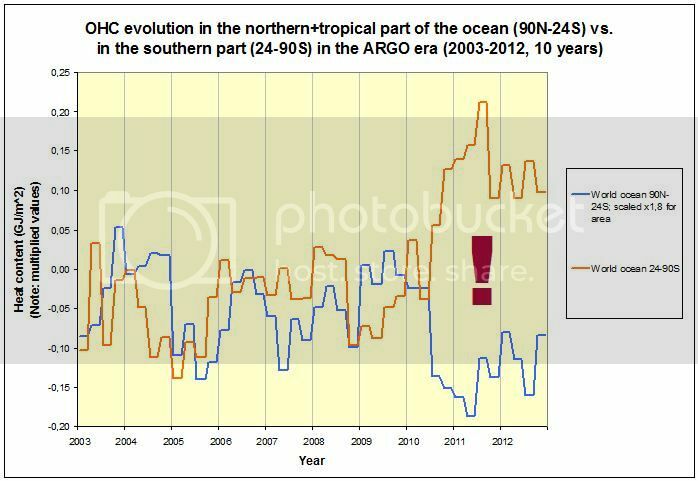 Figure 3 was presented and discussed (as Figure 25) in the post Is Ocean Heat Content Data All It’s Stacked Up to Be? 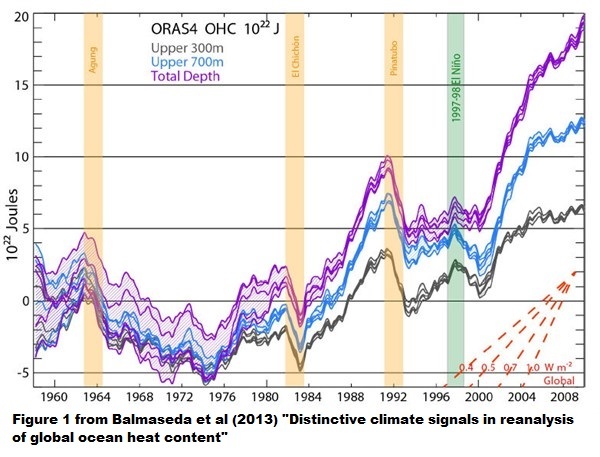 Ocean heat content is at best a make-believe dataset. Refer again to the post Is Ocean Heat Content Data All It’s Stacked Up to Be? Even with all of the adjustments to the NODC’s ocean heat content data, the data still indicates the warming resulted from natural factors, as shown in that linked post. A reanalysis is an even more abstract form of ocean heat content “data”—one that also requires “corrections” to provide the desired results. A reanalysis didn’t make the ARGO floats any better; it simply provided a way for Trenberth to confirm his beliefs–regardless of whether or not those beliefs are realistic. It’s pretty clear that these people are taking for granted that we are to take their pontifications about this subject seriously, that what’s making the oceans warmer is an anthropogenically enhanced GHE, and this even without them ever having revealed and quantified the working mechanism. One can’t help but wonder why. Even though the answer should be pretty clear: There is no such mechanism in operation where the atmosphere is forcing the ocean to accumulate more and more heat. Also, they have this notion that the oceans warm more or less evenly across the globe. That’s how the enhanced GHE (CO2) would work, after all. Whenever you or anyone else divide the ocean into subsets to show how different basins evolve quite distinctly from one another, at many times even following opposing trends, they tend to go mental. All they wish to see and advertise is the global curve, because that’s the one they’ve been working on to make it rise as smoothly as possible. Ridiculous. And oh so transparent. Notice how during the ARGO era, the northernmost two thirds of the world ocean (90N-24S) have in fact generally been cooling (NODC, 0-700m) while the southern third (24-90S) has generally been warming. But what happens mid 2010?! I was not able to answer quickly, because when it is day in your location it is night in mine. And now there are so many comments there, that I decided to answer here. We haven’t argued in our paper that PDO causes shifts in “global” SST. We only find some empirical evidence that warming in this regions occured through two sharp steps in 1925/1926 and 1987/1988. We don’t know what are the causes of these shifts. And ENSO/PDO indexes are reproducing most(or big part) of other observed variability in tropics(30S-30N)/north middle latitudes(30N-60N) (i.e. ENSO in tropics, PDO in north middle latitudes). We were surprised to obtain this result, but regression models are so simple and coincidence of different evidences is amazing. Now it is under review in Climate dynamics journal, but it is very interesting for me to know your opinion about this issue. One would assume it’s a response to the 2009/10 El Nino. Have you divided the data into 3 subsets: 90S-24S, 24S-24N, 24N-90N? Pavel Belolipetsky: Thanks for the reply. A question for you and your associates: Would it be possible to some way account for the warm water that’s left over from strong El Nino events–that causes the upward shifts in the sea surface temperatures of the South Atlantic, Indian and West Pacific oceans? That leaves the North Atlantic, which has the AMO, so it simply has some additional multidecadal variability on top of the natural warming of the rest of the global oceans. Please reply was you able to obtain it. Pavel Belolipetsky: Thank you for your prompt reply. Bob Tisdale: Here is my answer on other part of your question. Pavel Belolipetsky: Many thanks for your reply. In a couple of your analyses, you use the PDO, but the PDO is an abstract index of sea surface temperature anomalies–not sea surface temperature anomalies. There is no mechanism through which the PDO can cause those variations in sea surface temperatures. Bob Tisdale: You wrote that PDO is abstract index of sea surface temperature anomalies. I agree with this. And your question is how this abstract index can cause observed sea surface temperature anomalies. Well at first I didn’t argue that PDO is a cause of SST anomalies. May be our preprint and my answers to you give this false sensation. It is because of my English language and not clear explanations. My opinion is that PDO index reproduce (or partially reproduce) some mode of variability in Pacific atmosphere-ocean system. May be PDO index represents not the reason of SST anomalies, but the consequence. In any case PDO index is at least proxy for some process influencing SST anomalies in some regions. And I think our analysis shows that big part of low-frequency variability in North middle latitudes SST (30N-60N 0E-360E) and in West Pacific SST (90S-90N 100E-180E) is closely associated with PDO index. What mechanisms or physical processes may underlying this associating? Well I don’t know, but there are at least several possible variants. Small changes in cloudiness or spatial-temporal patterns of cloudiness are able to produce observed temperature variations. Another important factor is humidity. If we look in ocean there are couple of important parameters – depth of termocline, strength of vertical convective mixing and of horizontal heat transfer. I think we don’t know exactly what processes govern these important factors (cloudiness, humidity and etc.). And what is more important now we even not able to measure them with enough precession. The same situation often exists in other fields of knowledge. For example, it is known that sardines and anchovies abundance in Pacific Ocean is closely related to SST variations (Chavez et al. 2003, full links to articles are available in our preprint.). Sugihara et al. (2012) showed that SST are at least adequate proxy for the reason of sardines and anchovies variations, but the direct processes are under debates. Nevertheless, lack of knowledge of mechanisms is not a reason for rejecting observed associations between SST and fish abundances. Pingback: Will the Next El Niño Bring an End to the Slowdown in Global Surface Warming? | Watts Up With That?